Effective communication with others on the roads and paths is vital to keep your riding smooth-flowing and trouble-free. 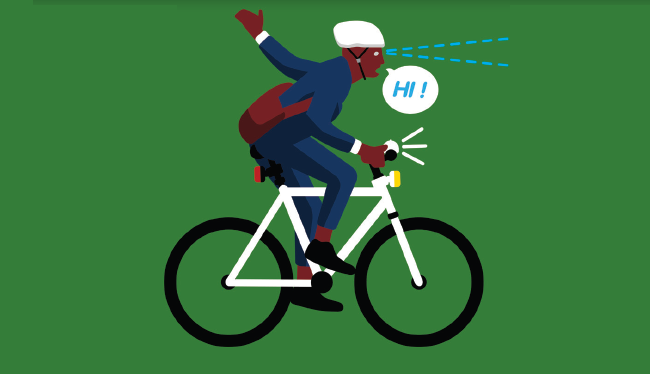 There are four types of communication that experienced bike riders use all the time. To let someone know you’re overtaking or crossing their path, use your bell or voice. This goes for other bike riders and pedestrians on a shared path. “Passing” is a commonly used call. “Hello” does the job too and sounds friendly. “Coming through” is effective as well. What is not effective is “On your right”, which tends to confuse people and can cause them to step into your path. Calling out “Stopping” is also very useful to prevent following bike riders running into the back of you, particularly if you have to stop in a hurry. Bells are great and should be used often. 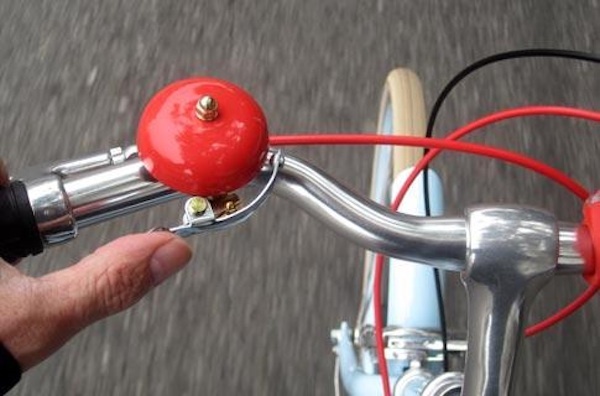 Get yourself a bell with a nice tone instead of the “ping” bells that come standard with bikes. A nice clear tone from a brass bell or a jaunty “bring-bring” type is a pleasant and distinctive sound that sets the expectation of “bike rider coming”. A good bell is effective at getting the attention of vehicle drivers as well. The only the signal that bike riders in Australia are legally required to make is the right turn signal. However, to keep the traffic flowing without collisions it’s a really good idea to signal turning, changing lanes, overtaking and pulling over – basically everything that’s not just riding straight ahead. It’s helpful to signal stopping too, particularly for following bike riders. 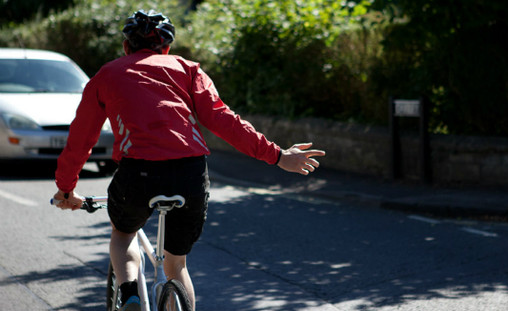 If you’re not confident about taking your hands off the handlebars to signal, you can use a hook turn to turn right. Simply pull over the left side of the road, wait until the traffic is clear in both directions and then make your right turn. That way you don’t need to signal at all. Making a clear signal is done with a straight arm and held out for a couple of seconds. Often it’s necessary to signal a second time, such as at an intersection where you have to give way and other traffic rolls up while you’re stopped there. At an intersection – or any situation when you’re negotiating turns with another road user, you want to know that they’ve seen you and understood what you’re doing. If you can make eye contact, you get a good sense of whether they have. Say you’re entering a roundabout and signalling a right turn. A driver approaching from the left needs to give way to you. Making eye contact with them while you’re signalling is the best assurance you can get that they know what you’re doing and will give way. Even holding eye contact for a short time slows down the driver’s movement through the intersection, lowering the risk of injury if a collision occurs. Bear in mind that apparent eye contact is not a guarantee that you have been seen. Bike Snob NYC in his recent Lyin’ Eyes article, is skeptical of the protective benefit eye contact affords. It’s your body language when you’re on the road – your road position works with your other communication, such as signalling, to tell others where you’re going next. Also like body language, your road positioning tells others whether you’re confident or hesitant about taking your place in the road system. 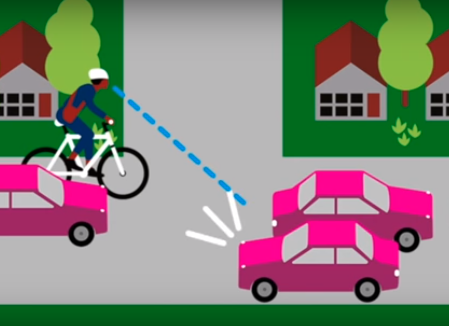 While the default position for bike riders – and for all vehicles in fact – is to keep left, this is not the best position for every situation. For example, signalling a right turn from the left side of the road is confusing and likely to be misunderstood by a car driver. Similarly, when the road is too narrow for a car to safely pass, you need to manage your own safety with road positioning. Examples of this are crossing a narrow bridge or when a median island and/or kerb extension reduces the width of the road. Approaching these scenarios bike riders have two options, to pull over and walk past the situation on the footpath, or, as early as possible (say 25 metres out), to head check, signal and merge into the lane when clear. When through the intersection or the road widens again, you can move back to the left side of lane. Know the rules and best ways to reduce your risks and ride with confidence. Learn the basics of riding a bike in a bunch to help your cycling on the road, on the commute or in an upcoming event. 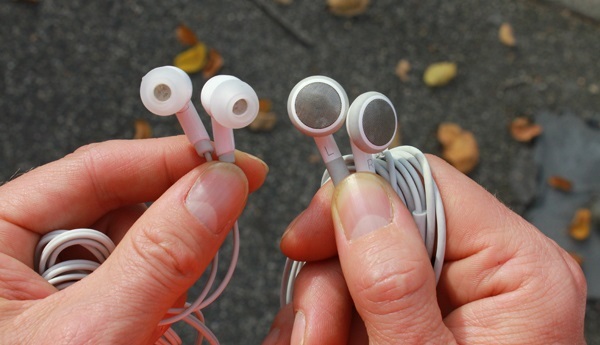 Can riding with earphones be distracting and who can hear more traffic buzz – a driver with the stereo on or a bike rider with headphones?